The Discogram sprocket comes with a Donut sticker cover. The Donut seat is available in Pivotal and Tripod versions. The Twisted Pro Pedals also come with a Donut wrap color as well. If that’s not enough, you could always pair these up with the GT Junk Food Pool Tires if you really wanted to get crazy. What do you think about this colorway? Are you digging it or not so much? Let us know what’s on your mind in the comments below! Is it time for a new BMX seat, but you want something unique? Federal Bikes have just released this limited edition Copyright Artist Seat that might just be what you’re looking for. This seat starts out with a Stealth Pivotal base with Mid size padding and a canvas cover with a sublimated design that covers the whole seat and a custom label tag. There are only 250 of these available worldwide, so hit up your favorite BMX shop or mail-order that carry Federal Bikes to get one ASAP if you’re trying to get one before they’re gone. What do you think of the Copyright Artist Stealth Pivotal seat from Federal? Do you have any questions? Let us know what’s on your mind in the comments below! Are you on the hunt for a BMX Seat that is slim and really clean looking? You’re in luck because Flybikes have brought back a limited run of their popular Dos Tripod seat. The Dos 5 Seat starts out with the Slim Tripod base with 5mm of padding and a black vinyl cover that’ll resist the wear and tear giving it a slim and aerodynamic look. The seat measures in a 225mm long and 120mm wide, and weighs in at 7.58 oz. You can pick up the Dos 5 Tripod seat for $25.00 on the Flybikes webstore now. What do you think of the Dos 5 seat? Do you have any questions? Let us know what’s on your mind in the comments below! Are you into space and stars? Here’s one you will be stoked on. Odyssey have just released the new Aaron Ross signature Star Map seat for you to dial your bike in with. The seat is available in Pivotal and Tripod seat versions and can be picked up through BMX shops and mail-orders that carry Odyssey for $34.99 now! “Our limited edition Star Map seat features a custom constellations pattern. Each seat is different and unique! Stranger coming through with a short but sweet promo video giving you a look at the Nate Richter Signature ZIA line that’s hitting BMX shops and mail-orders now. This video gives you a look at the ZIA seat and ZIA peg, along with a few riding clips for good measure. Take a peek! Kink coming through with a quick promo video featuring Travis Hughes and the Sean Sexton signature SXTN Stealth Pivotal Seat. Travis talks a little bit about the seat and throws down a few hammers for you to check out in the video below! Take a peek! 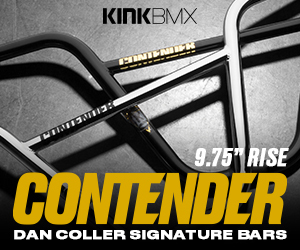 “Kink Pro Travis Hughes reps the Kink SXTN Stealth Pivotal Seat, throwing down a little bit of insight (kinda), and a whole lot of shredding! The SXTN Stealth Pivotal Seat is available for $32.99 through BMX Shops and Mail-Orders that carry Kink BMX worlwide now! BSD have been working with Dan Paley on his new signature Soulja Seat that is landing this month. This Mid sized Pivotal seat has a black fabric top with a woven Nylon rear panel that features OG camouflage and Urban camouflage on the back with a embroidered Soulja tag. The Soulja seat will be available through BMX shops and mail-orders that carry BSD worldwide in the next week or two, so get ready if you’re digging this one. Check out more from BSD. Not feeling this one? Check out more BMX Seats.